Mmm, Bubby’s. It’s been long enough since I last featured them that I can do it again, right? Right. Bubby’s Deli is my favorite place for breakfast or brunch. It’s really convenient, being right on the edge of downtown (so it’s walking distance from the square) and also surrounded by street parking on Deer/High Streets (so if you’re driving, it’s also an easy place to stop). The staff there is super awesome and always friendly, speedy and a delight — and, most importantly: they have latkes. I slathered mine with sour cream before snapping this pic, but, trust me, Bubby’s latkes are the most crispy and delicious potato pancakes ever. Now, normally I’d get the challa bread as my toast selection, but since I went all out and got French Toast, too (because they serve half-orders, what?! ), in addition to this “Basic Breakfast” plate, I went with pumpernickel to mix it up. 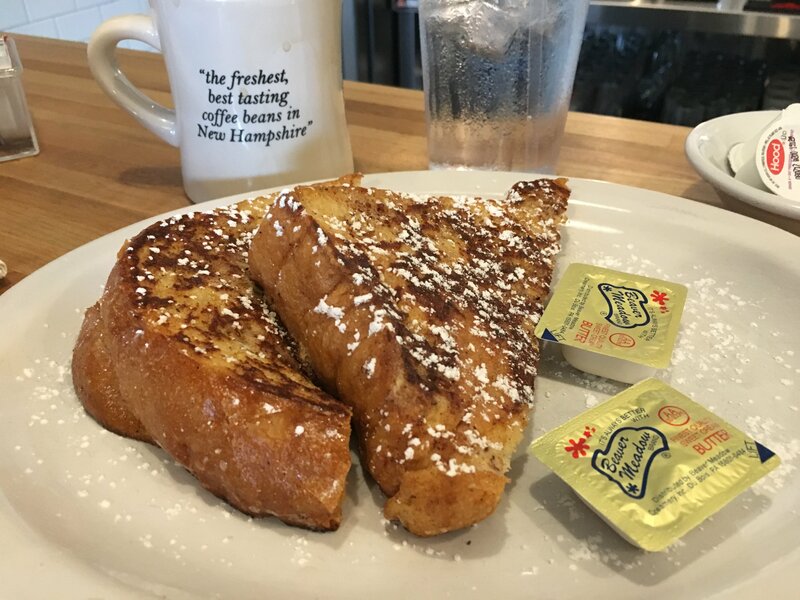 No regrets ever at Bubby’s. And yep, that’s some Dan Blakeslee art on their T-shirts (and on the menus, too). Also, they’re still sporting their PRIDE supporter sticker from last year! In that case there they have bread, pickles and bagels that are crazy good, which you can stop in and get to go. Their bagel breakfast sandwiches are pretty unparalleled in Portsmouth. Go to Bubby’s. Get all the latkes. And everything else you want.